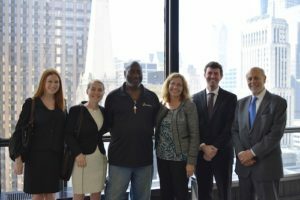 From left: Co-Counsel Kate Schwartz of Hughes Socol Piers Resnick Dym, Ltd., Staff Attorney Diane O’Connell, Robert Henderson, Law Project Director Patricia Nix-Hodes, Staff Attorney Graham Bowman, and Co-Counsel Matt Piers of Hughes Socol Piers Resnick Dym, Ltd.
A Cook County judge has ruled against dismissing a lawsuit filed by a homeless man whose belongings were thrown away by a city street crew. Attorneys from the Chicago Coalition for the Homeless and their co-counsels sued the city of Chicago in March for illegally destroying property, including vital prescriptions and blankets, belonging to Robert Henderson, 62, when he lived under a viaduct on the Near West Side. The September 6 ruling by Judge James E. Snyder allows the case to proceed in court. It is one of the first cases filed under the Illinois Bill of Rights for the Homeless Act, enacted three years ago. “This is great, not only for me, but people that are in my position as well. Our voices are being heard… We are human beings and should be treated like human beings,” said Mr. Henderson. Co-counseling are Hughes Socol Piers Resnick Dym, Ltd. and the Chicago Lawyers Committee for Civil Rights Under the Law, Inc.
Read Chicago Sun-Times columnist Mark Brown’s account of Mr. Henderson’s case. On the morning of November 2, 2015, Mr. Henderson left the viaduct briefly. When he returned, he was told that city workers had thrown all his possessions into a garbage truck. City officials told other individuals who lived under the viaduct, and later Mr. Henderson, that they had to leave due to complaints from a nearby business. Mr. Henderson suffers from chronic health conditions, including hypertension and chronic obstructive pulmonary disease. Without his prescriptions, he was in danger of suffering a heart attack. It took more than a month to refill his medications as he searched for a new place to stay. The Illinois General Assembly enacted the Illinois Bill of Rights for the Homeless Act in 2013. This law makes it illegal for government agencies to discriminate against people who are homeless. This includes the requirement that the property belonging to a homeless person be treated the same as that of a person who is stably housed. Illinois was the second state in the U.S. to pass legislation guaranteeing civil rights protections for homeless people.